Retrospective: The Company of Wolves | Anime etc. Quack! It’s a sacrificial duck, which the peasants are using in the scene to lure the beast to its doom. In a flash, the dark lord of the forest turns tail and runs for its life. “It was terrified of the duck!” remembers director Neil Jordan. It’s an anecdote almost as strange as the film itself. Neil Jordan is a front-rank director now, thanks to The Crying Game and Interview with a Vampire, but The Company of Wolves was only his second film. His debut was Angel – nothing to do with vampires, but a gritty, downbeat crime drama starring Stephen Rea, who would reappear in several Jordan films, including Company of Wolves. Back then, Jordan was arguably more famous for his literary work, having written two novels and a short-story collection. Jordan was wearing his author’s hat when he went to Dublin in 1982 for a conference celebrating James Joyce’s centenary. Here he met Angela Carter, whose novels dated to the 1960s (including another surreal story of a girl’s coming of age, The Magic Toyshop, filmed in 1987). However, she was most famous for her 1979 story collection, The Bloody Chamber. The stories drew on traditional fairy tales, taking them in unexpected ways to decidedly non-patriarchal resolutions. But Carter bristled when asked if her book was an exercise in feminist revisionism. In Carter’s words, “My intention was not to do ‘versions’ or, as the American edition of the book said, horribly, ‘adult’ fairy tales, but to extract the latent content from traditional stories.” Among them was Red Riding Hood, which Carter reworked as “The Company of Wolves.” In this brief tale, a young girl finds a werewolf lurking in her granny’s house, but proves more than a match for it. The spectacular wolf transformations were handled by effects artist Christopher Tucker, who had created John Hurt’s makeup for the title role in The Elephant Man. A sinister “traveling man,” played by Stephen Rea, literally tears his own face away. Later, a flamboyantly seductive huntsman, played by the dancer Mischa Bergese, howls in agony, only for a wolf’s muzzle to push out of his jaws. It’s much the same kind of body-horror coup that John Carpenter had recently used to different ends in The Thing. Company’s cast included such familiar British faces as Brian Glover, Graham Crowden, David Warner (who plays Rosaleen’s father in the real and fantasy worlds) and Angela Lansbury as the girl’s stern grandmother, with a living fox-fur round her neck. The central role of Rosaleen went to 13 year-old newcomer Sarah Patterson, who fitted Jordan’s idea of a bright, unaffected girl, naïve but at the same time preternaturally bold. By an extraordinary coincidence, Patterson came from the same Hampstead school where granny Lansbury studied several decades earlier. For the cameo role of the Devil, Jordan had been hoping to get Andy Warhol, but when the artist refused to fly to England, Terence Stamp stepped in, taking the role for the price of a new suit. The naked “wolfgirl” who emerges from a well (described by Jordan as Rosaleen’s alter-ego) was played by underground musician Danielle Dax. The film opened in Leicester Square, but both Jordan and Carter were disappointed that it was given an “18” certificate. As the critic Philip French pointed out in his review, the certificate excluded “the mid-teenagers who would especially understand, enjoy and be enriched by the film.” The average person might think that it was moments such as Rea gorily tearing off his face that led to the restrictive rating. Carter, though, thought it was down to politics. “The Thatcherite censorship found (the film) subtly offensive. They couldn’t put their finger on it, but they knew something was wrong,” she told Marxism Today. Jordan, of course, went on to world fame as a director, and is now developing a version of Neil Gaiman’s The Graveyard Book. Other participants in The Company of Wolves have been less fortunate. Carter died from cancer in 1992, aged 51. Anton Furst went on to win an Oscar for designing Gotham City in Tim Burton’s Batman, but he committed suicide shortly afterward. And after her bright start, Patterson faded from view; one of her few subsequent credits was in a straight-to-video Snow White, opposite Diana Rigg. 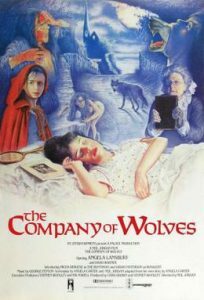 Director Neil Jordan hoped to use real wolves in the film. “There were four wolves that we could track down in the entire British Isles,” he says. “Two of them were in Scotland, and we had them driven down, but on the way one wolf ate the other in the back of the truck.” After that disaster, Jordan used the surviving wolves sparingly, often substituting Alsatians and Malamutes (a Malamute is a cross between an Alsatian and a husky). However, in a climactic scene where the girl puts her arms round a wolf, it’s a real wolf she’s hugging. Brrr.